Now that my best of 2009 is complete, on to 2010. My top 10 most highly anticipated albums of this year. If you have any additional info about any of these albums, please post it in the comments! 1. 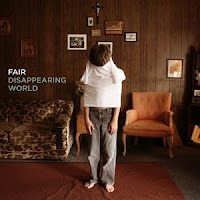 Fair- Disappearing World. To be released February 9 on Tooth and Nail Records. Thankfully my most highly anticipated release of the year is only a month away. 2. Sixpence None the Richer. No title or release date. Will be in the studio in January with a projected Summer release. Fairly optimistic after an outstanding EP in 2008. Hopefully they don't do any 80s covers and don't try to write any pop songs. 3. Eisley. No title or release date. Album is apparently finished, and two songs from it have already been released as the Fire Kite EP. One of the songs from the EP, "Ambulance", is perhaps my favorite Eisley song. Spring release. 4. Jimmy Eat World. No title or release date. Are in the studio with Mark Trombino again (produced Clarity). I will guess a Fall release. Have enjoyed everything the band has ever done, but I am hoping for an album a little more diverse than the last one. 5. Fleming & John. I have no idea if this is really happening, but was mentioned on Paste's website and there have been rumors for years. They haven't put anything out since 1999 so I doubt it will actually happen. If it does expect it to be outstanding. 6. Rosie Thomas. No title or release date. Mentioned on her Myspace that she will be recording with David Bazan soon. I will guess a Fall release. With her angelic voice, she can't go wrong. 7. She & Him- Volume 2. To be released on March 23 on Merge Records. Zooey's voice is gorgeous, can't wait. 8. Arcade Fire. No title or release date. May is the rumor. 9. The New Pornographers. No title or release date, but Spring is the rumor. 10. Theft- Nothing Gold Will Stay. Album is apparently finished, but no release date has been given. Album has been in the works for years, and will be Matt McCartie's (Driver 8, National, etc.) first release in forever. Frontier(s). New band from Chris Higdon of Elliott. The one song they have released is more aggressive and unfortunately less interesting than Elliott. Very curious though. Mates of State and Nada Surf are both set to release covers albums this year. I love both these bands, and I am especially interested to hear Mates of State's takes on others songs. Both bands happen to be on Barsuk, so maybe the label's idea. I can't really imagine label-mate Dave Bazan doing a covers album though. The Nada Surf album is complete, the Mates of State is in process. GRITS. Waited too long (Oct. 2009) to discover their outstanding 2008 release, Reiterate. New album in March. Only hip-hop/rap group I listen to. Zookeeper. Mentioned a lot about this in my recent interview with Chris Simpson. Simpson's former band, Mineral, also set to release a "box set" this year, but with no new material unfortunately. Will be nice to hear some 7" songs in digital format for the first time. Patty Griffin- Downtown Church. Releases Jan. 26. Big fan of hers, but her last album was my least favorite thing she has ever done. Hopefully this one is a little less produced. Spoon- Transference. Releases Jan. 26. Not a huge Spoon fan as I was late in the game to discover them (2007), but everything they put out is outstanding. Band of Horses- Night Rainbows. Also not a huge fan, but I got their second album on vinyl and played it frequently. No release date. L.S.U.- PTSD. There have been rumors about this album forever; the first release from Michael Knott in awhile. I was obsessed with him in the 90's, then barely listened to him in the 00's. I am very curious about this album though because of the great musicians he worked with. Album is supposedly finished, but no release date has been announced. Leeland P.- Tess Wiley singing lead vocals for this German electronic band; album releases in the Spring. Swarm of Bats- 8-song EP supposedly to be released at any point from 4/5 of Brandtson.